Five months after the election of Abraham Lincoln, which had revealed the fracturing state of the nation, Confederates fired on Fort Sumter and the fight for the Union began in earnest. This documentary reader offers a firsthand look at the constitutional debates that consumed the country in those fraught five months. Day by day, week by week, these documents chart the political path, and the insurmountable differences, that led directly—but not inevitably—to the American Civil War. 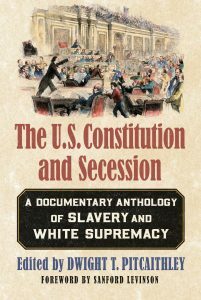 In The U.S. Constitution and Secession; A Documentary Ahthology of Slavery and White Supremacy, Dwight Pitcaithley has assembled the quintessential public statements that lead to the South’s secession in an effort to maintain slavery and advance white supremacy. 1. When did you first have the idea to work on The U.S. Constitution and Secession? I began my research on secession upon my retirement from the National Park Service in 2005 simply to satisfy my own curiosity. I knew that slavery was at the core of the secession movement, but I did not understand exactly how. As I started uncovering the dozens of proposed solutions to the “problem” posed by Lincoln’s election in 1860 the idea for a book began taking shape. Once I realized that no one had ever codified or analyzed the sixty-seven suggested constitutional amendments or written about them as a specific category of evidence, I started conceptualizing the book. 2. Can you describe your process of writing? How long did you spend working on the book? From start to finish the book took about a decade. Locating and analyzing the published proceedings from the various official gatherings over Secession Winter took a fair amount of time. Then I had to determine what the proposed constitutional amendments meant. Were they honest efforts to solve the sectional crisis or were they just designed to stall or prolong the deliberative process. Once I understood their import, I began crafting a monograph, organized by geographic regions, that described and analyzed the amendments. I became dissatisfied with that manuscript because of the repetitive nature of the proposed solutions. I then shifted to a documentary reader format with an extended introduction. Crafting the introduction spanned around three years. During the process of understanding the puzzle of secession, I became intrigued with the symbiotic relationship between slavery and white supremacy and the degree to which southerners assumed and defended that connection. Factoring that relationship into the research and writing process provided new meaning to the proceedings of the elected officials over Secession Winter. 3. What was the most challenging aspect of editing the publication? The most challenging (and yet, in an interesting way, rewarding) aspect of the editing process was chasing down sources for the un-attributed quotes, allusions to historical and fictional characters, and references to classical literature that were imbedded throughout the official documents. The Witch of Endor and Mazeppa, for example, were not part of my educational background. 4. The U.S. Constitution and Secession is, essentially, the nail in the coffin for those arguing that the Civil War was not about slavery. How do you respond to people who maintain their argument that Southern states seceded for any reason other than the protection of slavery and white supremacy? People can and do believe what they want to believe. If, after reading The U.S. Constitution and Secession, they still maintain that secession was not about slavery, they need to develop the case that Jefferson Davis, Alexander Stephens, Robert Toombs, John Crittenden (and virtually all elected officials at the time) were prevaricating when they explained to their peers that slavery was the root cause of secession. 5. Do you expect, or have you received any negative feedback from your book and the case you are presenting? I have received no negative comments as yet although I certainly expect some. And I will welcome challenges to the book and its findings. The resulting conversation will help get us where we need to go. 6. What is your reaction to recent events that have triggered a new debate over the roots of the civil war? My first reaction is sadness that the notion of white supremacy continues to motivate individuals to violence. The events of Charleston and Charlottesville and other places remind us of how far we have yet to go regarding race relations, how debilitating racism continues to be. This nation can abolish slavery and legislate against segregation, but the solution to white supremacist thinking seems to confound us. At the same time, the public debate over the proper role Confederate memory plays in our society should be welcomed. Airing the dark aspects of this country’s past will help us understand the relationship between then and now, and how decisions we make about the future should not be based on false histories. 7. If you could have any one person read your book, who would it be and why? President Trump. It might help him understand the historical (and contemporary) corrosiveness of white supremacy. Dwight T. Pitcaithley is a college professor of history at New Mexico State University. He is a former Chief Historian of the National Park Service.